Brilliant 3 bedroom holiday home sleeping 10 near Belves, Dordogne and Lot. A splendid holiday villa for an unforgettable family holiday, this property offers a private pool and has everything you're looking for in a holiday home! Air conditioning. On site parking. Satellite TV. Cot available. Highchair available. Airport within 1 hour. Pets not accepted. 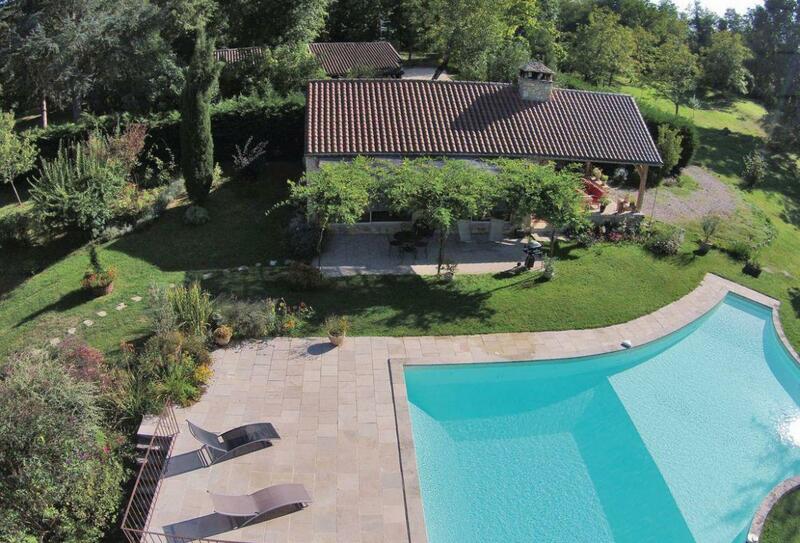 This splendid, detached villa, with air-conditioning and sumptuous infinity pool, is a real paradise in the Dordogne! Peacefully nestled on the banks of a river, with private access to it, this property has been beautifully renovated to offer you a dream holiday. It is set in a small quiet hamlet behind the owner’s home, halfway between Siorac-en-Périgord and Saint-Cyprien. Three master bedrooms await you with their en-suite bathrooms, and you will fall under the spell of bright and spacious living rooms. There are also two mezzanine bedrooms (with low ceilings). Relax on the open terrace, or enjoy dining al fresco on the covered terrace. Visit the splendid Château de Beynac, 15km, or take a canoe trip on the river. Continue on to Le Buisson-de-Cadouin or Les Eyziers, which is a village that is definitely worth a visit, especially for its museum dedicated to prehistory and its caves. Other places to visit include Château de Marqueyssac and its gardens, or Sarlat with its magnificent medieval centre. Golfers can enjoy a great golf course just 2km from the property. Shop and restaurant 2km. Open plan living space 1: With tiled floor. Living area: With satellite TV and French doors leading to garden. Kitchen area: With gas/electric cooker, microwave, fridge/freezer, dishwasher, coffee machine, washing machine, tumble dryer and beams. Bedroom 1: With double bed and en-suite with shower cubicle, toilet, heated towel rail and double basin. Mezzanine 1: With single bed, pull-out single bed, beams and low sloping ceilings. Mezzanine 2: With double bed, beams and low sloping ceilings. Open plan living space 2. Kitchen area: With electric oven, gas hob and coffee machine. Bedroom 3: With double bed and en-suite with shower cubicle, toilet and double basin. Maximum occupancy 6 adults and 4 children. Oil heater. Wi-Fi. Cot and highchair. Enclosed garden with terraces, garden furniture, sun loungers and gas BBQ. Outdoor swimming pool (private, 140m², open Apr-Oct weather permitting). Private parking for 4 cars. No smoking. Please note: Sorry, no hen or stag parties. The property is situated on the banks of the river with direct access to it, and there are drops and steps in the garden.